King Saul did not know what to do. No one was brave enough in Israel to go against this giant. He wasn’t in the best emotional, psychological shape to lead a nation. The king was afraid and the whole nation was afraid. Goliath truly had faith in his ability as a soldier; he challenged any man from the Jewish army to come and fight him, but no one was brave enough there. What happen to the great nation of Israel, God’s chosen people? They had forgotten whom they represented; their faith was gone. Fear paralyzed the nation; they could not move pass the Philistines due to their fear. When the leader of a nation walks defeated and faithless, so will those he leads; those who were looking to him for encouragement and for leadership. This is one of those distressing times in the history of Israel. David heard Goliath’s words and he took them personal. (v.23) He was ready to go and fight the giant. What was it about David that gave him confidence, even when everyone else shook in their boots at the size of Goliath? Who does he think he is? He doesn’t realize that we are children of the Living God? There is not identity crisis with David. Sometimes when we face difficult challenges we tend to forget that we served the Living God. We lose our own identity and focus on the problem rather than the One stronger than any battle we could possibly face. David is the only one who had enough faith to come against the giant. The strength of your faith is measured during adversity. The king didn’t think David could do this (v.33) you are just a boy and this man has been a warrior since his youth. (Statistically speaking David didn’t even have a chance). David knew he served a God who cannot be broken down to a science. King Saul still thought David needed to be dressed appropriately for battle. Facing your own giants, you cannot pretend to be someone else. David could not go fight Goliath as a soldier, for he wasn’t a soldier, he went just as he was, a shepherd with the weapons he fought lions and bears. A shepherd’s pouch, a sling and a stone (oh what I would do to have the kind of strength it takes to stand before a giant with just a sling and stone. Surrounded by the sound of a 1000 warriors shaking in their armor wishing they’d had the strength to stand. Casting crowns). David relied on God. (v.41-47) The giant came with all he had, but David came against the giant in the name of the LORD Almighty the God of the armies of Israel. Everyone will know that God doesn’t need a sword or spear to save. The battle belongs to the LORD. David struck the Philistine on the forehead and the stone sank into his forehead. (v.50) David overcame the giant with a sling and a stone, without a sword in his hand. The LORD gave David the victory. Any obstacle we face as God’s children we must face it courageously because our LORD is bigger that any problem, issue or difficulty we face on this earth. Only God gives us the confidence to be brave when everyone else is panicking; you have to remember that the LORD of heaven and earth fights on your behalf. Your battles are his battles; your struggles and difficulties are his, hardships, are his. Our God is greater our God is stronger, God you are higher than any other. If he is with us who or what can come against us. More than a song or anthem, this needs to be truly lived out as you face your own giants in your life. Are the giants keeping you down? Overwhelming your life? Making you fearful? In order to overcome them, you must stand in the name of the LORD with confidence. You must Trust in God. God will give you the victory when you stand in his strength; when you trust him enough to face the giants courageously like David. 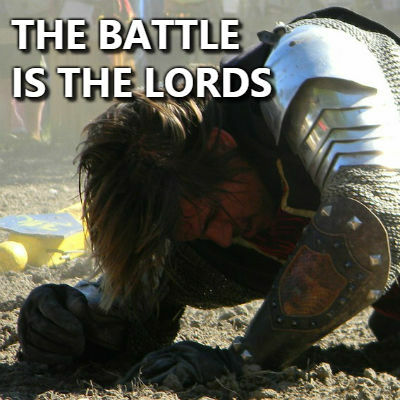 The Battle belongs to the LORD.